Crafting is how to make Pumpkin Pie in Minecraft. The player will first need one crafting table. It can be made by opening your inventory box and placing 4 Wooden Planks into the 2×2 grid. The recipe for a Pumpkin Pie is 1 Sugar, 1 Pumpkin, and 1 Egg. Pumpkin is made from farming Pumpkin Seeds you can find naturally in abandoned mineshaft. Sugar is obtained by Crafting Sugar Cane which the player can find around places with water like lakes. The last ingredient is an Egg which is laid by the Mob Chicken automatically every 5 to 10 minutes. A Chicken does not drop an Egg if killed. Pumpkin Pie has the benefit of being able to be made in your inventory since it does not require Smelting or anything more than the 2×2 grid. 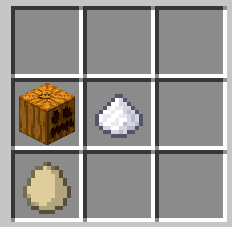 Now that you have learned how to make Pumpkin Pie in Minecraft, it can also be noted that the item is able to be stacked when carried.